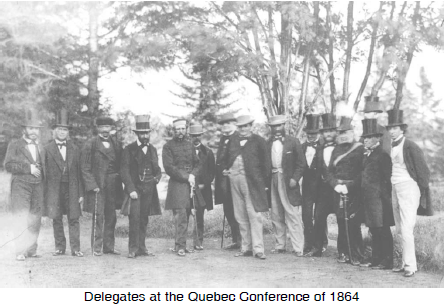 On October 10, 1864, delegates from Canada and the Maritimes met again to discuss the ideas raised at the Charlottetown Conference the month before. They now had their proposals listed as 72 resolutions. These were refined over the next two weeks and the resulting agreement - the Quebec Resolutions - was substantially the same as the British North America Act which became the founding constitution of Canada in 1867. While trying to work out an agreement, the delegates argued about whether this should be a legislative or a federal union. John A. Macdonald favoured a legislative union which would have a strong central government. The Maritimers and French Canadians pressed for a federal union, where each member was an equal partner. In the end, the delegates agreed to a compromise. The provinces would keep control of a specific list of powers including education and language and the federal government would have residual, or all other unlisted powers necessary for "peace, order and good government." They also agreed to have two houses of government - a lower house - the House of Commons, today - which would be based on representation by population; and an upper house - the Senate - which would give regional representation.